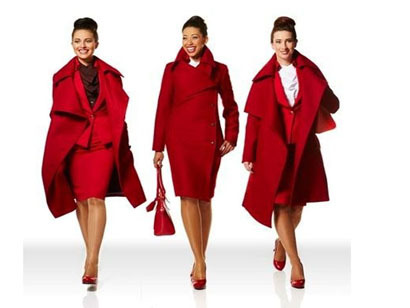 They have been in action since September but have not yet made headlines: the Virgin Atlantic uniforms are an example to all. Devised by ‘the terrible child of fashion’ – the eccentric and awesome Vivienne Westwood – these uniforms are unique, having been designed in recycled materials. Not easy to spot when you encounter such elegance of a fleet in its totality. Three-piece suits for the men, belted or red lipstick suits for the women, a sophisticated white blouse… with masterful insight: the ‘drape coat’. The detail that makes the difference is the nano-finish, preserving colour and improving the life span of these 22 pieces.